Maybe we can take up a donation and get Juan to do an instructional video for us? Like a subscription based video shop manual for all things 500x. Also, taper rollers bearings in a head stem requires preload resulting in braking effect at the steering head; a great way to introduce "speed wobble". Ball bearings have precision point contact, no resistance in the steering, which is why they use them in steering heads. Taper rollers bearings are a good idea for dirt bikes but not road bikes. Hi Manray, the problem with that particular All-Balls kit in the video is that the seal might be a little fat. The CB kit fits perfectly fine. I respectfully disagree - and anyway, what we are primarily talking about here is beefing up the steering bearings in the CB for those riders who are using their 200Kg bike more regularly off-road and on rough surface [unpaved] roads and trails at speed. Taper roller bearings offer a far greater contact point and therefore help to spread the load and weight than the point load on a traditional ball-bearing. I currently own eight bikes and I have owned many in the past. The CB is the only road bike I have owned with ball bearings. All the rest are roller bearings. The only time I have had head shake with roller bearings is due to something wrong with the bike or the bike being loaded too heavy in the rear. Even the pedal bicycles I have owned have the tapered roller bearings in the steering head. Well, good to know the CB500 All Balls rubber seal fit is fine. Whichever type of bearings one decides to use, grease the bearings well. For owners using the OEM head bearings, it seems from factory they come a bit dry so the recommendation is to disassemble and re-grease to increase longevity. After reviewing all the information from others on the CB500X stock head bearings I decided to change mine out given I had the front end apart to service forks and to change the RR top bridge risers to accommodate Fatbars. 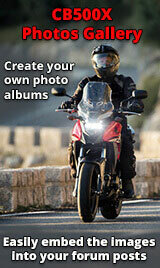 The bike has 12,000 miles on it, about 3,000 of which were on unmade roads. There was no notchiness or play in the stock system. Firstly, unlike other reports both bearings on my unit were very well greased from the factory (as can be seen in the picture). 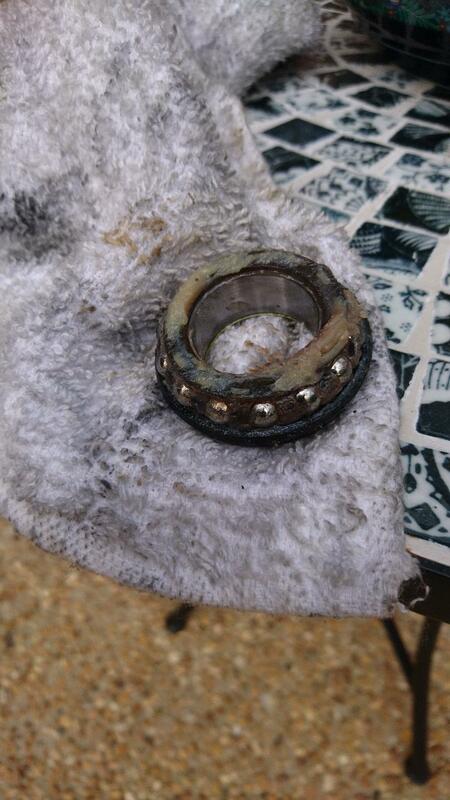 The races were unmarked, the lower bearings and cage ditto, however as seen in the picture the upper bearing cage showed evidence of water penetration and some (light) corrosion. So replacement proved timely. They were replaced with All Balls tapered bearing kit. Everything fit as it should, including the top dust seal which others had suggested was a potentially oversized (I think they had the wrong kit/seal perhaps). Lower bearing race removal not so easy due to the recess so had to concoct the 'Dasco' tool to ease it out. Took time and lots of little and some not so little taps. Getting the lower race off the steering stem - ditto. Slightly marred the seats so smoothed them off GENTLY with wet/dry before inserting the new bearing. Upper bearing removal and replacement - piece of cake. Have 1,000+ miles with the new bearing (including unmade roads), all good. +1 good post, I have found the same thing,Ball bearings are best for road bikes. Tapered rollers are better IF the rollers are tapered as well as the races. In some cheaper bearings available I have seen tapered races with cylindrical rollers. These are MUCH worse than ball bearings. In a tapered bearing the smaller diameter end of the race travels less than the larger end ( same angle less distance). This causes the bearings to scud even if all bits are parallel. A proper tapered roller has non parallel cones with tapered rollers as well. Tapered's are also VERY sensitive to the bearing tightness load and can give false torque readings when tightening ( see the video as to one reason). Pays to recheck the tightness arter some riding if using them. That means disassembly to some extent. So if you aren't willing to do that extra work I suggest go with ball bearings as they will slop less if not correct tension. The small contact area of a ball negates (to some extent) the problem of tolerences and skidding . To be honest a dual "normal" bearing top and bottom would be better. One for the axial loads and one for the radial. With small balls to allow reasonable rolling track ( steerers don't travel very far or fast axially so tend to wear a short track. By the way, many modern bikes are now fitting "over the counter" bearings, rather than proprietary bearings, so you often can find high quality cheaper replacements. Haven't had the x's triple clamp off yet so haven't checked whether it is the case for our bikes.